Gmail is free a web based email service provided by Google. It is simple, fast and not too fancy like other free email services available. It was launched in 2004 and was only available on invitation by existing Gmail users but in 2007 it was opened for all and I have been using it for over a year now and have never experienced any difficulty in accessing my emails. Its current email storage capacity is over 7 GB (1 GB = 1024 MB) so that is lots of space for storing all types of media attached to any email. Today when I opened my inbox I noticed that Gmail now has more custom designed themes which if applied can change the looks and feel of your inbox. Have a look at the following screen shot. 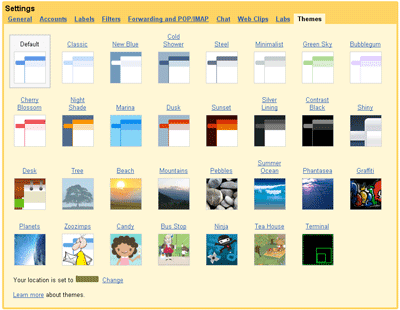 There are 31 different themes available (including the default theme) .The good part is that none of these themes will cause your browser to crash or slow down your Gmail loading time. Few of those themes are designed in a way that they look different at different times of the day depending upon various factors that include sunrise, sunset and weather. You will only need to select your region(Country/City) when applying any of the above mentioned themes. So Google mail or simply Gmail is not just a secure email service that helps you fight email spam but it has to offer much more than just sending and receiving emails. Its recent release of voice and video chat for its web based chat system is already catching lot of attention.